`A chilling, gut-wrenching thriller.' 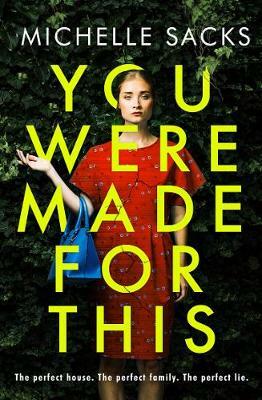 Helen Fields A bold, sharp, gripping debut about a couple whose perfect life in the Swedish countryside is not what it seems... A gripping page-turner for fans of The Couple Next Door, Michelle Sacks's You Were Made For This provocatively explores the darker side of marriage, motherhood and friendship. Doting wife, devoted husband, cherished child. Merry, Sam and Conor are the perfect family in the perfect place. Merry adores baking, gardening, and caring for her infant son, while Sam pursues a new career in film. In their idyllic house in the Swedish woods, they can hardly believe how lucky they are. What perfect new lives they've built for themselves, away from New York and the events that overshadowed their happiness there. And then Merry's closest friend Frank comes to stay. All their lives, the two women have been more like sisters than best friends. And that's why Frank sees things that others might miss. Treacherous things that unfold behind closed doors. But soon it's clear that everyone inside the house has something to hide. And as the truth begins to show through the cracks, Merry, Frank, and Sam grow all the more desperate to keep their picture-perfect lives intact.